Once upon a time, there were three genius tennis players: Novak, Rafael and Roger. These maestros were so incredible that between them they won virtually every tennis tournament. Some said they were the best, ever – which (think Laver, McEnroe, Borg, Sampras) is saying something. The next best tennis player was a tetchy guy called Andy, but he hardly won any major tournaments, due to the fact he was nowhere near as good as the Big Three. Every year, Andy bust a gut at multiple tennis tournaments around the world, and every year he had to watch one of the Big Three carrying away the silverware. There were exceptions, such as the Qatar ExxonMobil Open, but usually that was only because the Big Three didn’t bother to turn up. Wise pundits concurred: Andy’s perennial lack of success on the big stage was because in tennis there is a huge gulf between the fourth best player in the world and the best player in the world. In fact, there is as big a chasm between Number 4 and Number 1, as there is between Number 10 and Number 4! No wonder Andy was always the Best Man, never the Groom. Well, as sometimes happens, Conventional Wisdom was seriously questioned yesterday, when Rafael got taken apart by Number 100. Yes, that’s right. 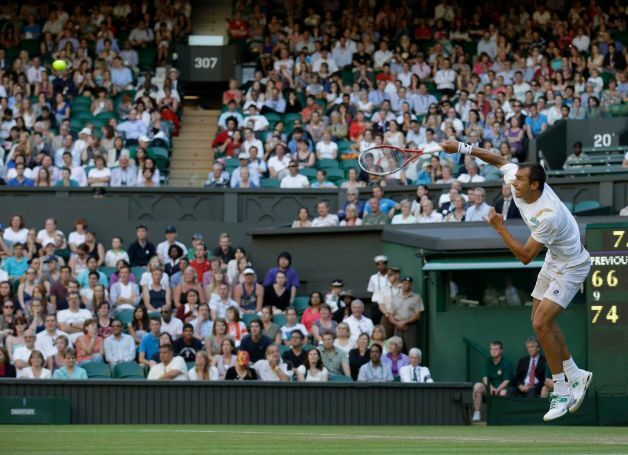 The world Number 100 ripped the World Number 2 to bits on Wimbledon’s Centre Court. It really was not supposed to happen. And until last night, no-one had even heard of Lukas Rosol. He was just another plodding journeyman being served up as practice fodder for the mighty Rafael. David to Goliath, if you will. But, as every student of ancient Hebrew Scripture knows, Goliath doesn’t always win (see 1 Samuel 17 for details). Sometimes, the boy David rips up the script and shoves it down Big G’s throat. It’s inspirational stuff. For every small firm operating out of hot, downbeat offices in the back end of nowhere, Lukas Rosol is a hero. He did not blink. He stayed focused. He had a job to do and he did it. Conventional Wisdom also said he was supposed to choke at the big moment. But he did not. He wasn’t intimidated by the stature or past experience of the competition. Frankly, my dear, he did not give a stuff. He knew he was wildly under-rated and he just let his game do the talking. In 2012, the rules of the game have all changed. You can be 18 years old and build a world-beating business from your bedroom. You can be a very small firm and yet deliver your unique IP to a huge client base, turn your industry on its head and start a revolution in your space. These days, anything and everything are possible. All you need is the willpower (and the unique IP). We could be about to see the biggest upset at Wimbledon since Peter Doohan beat defending champion Boris Becker in 1987. Strap yourselves in, here we go… ACE! FOREHAND WINNER, ROSOL! ACE! THREE MATCH-POINTS! ACE! BING-BADDA-BING, RAFA’S TOAST! The big question for me is: where does Rosol go from here? He’s not a youngster bursting onto the scene. He’s a few weeks shy of his 27th birthday. Has he suddenly found a strength and a belief that will propel him into the top echelons or world tennis – or was this a one-off, like a non-league club beating a Premiership team in the FA Cup and then returning to normal service? But it goes deeper than that, doesn’t it? This wasn’t just a case of Rosol upping his game a little or Rafa dropping his. Rosol seemed to be hitting the ball astonishingly hard, point after point after point. If it had been Federer playing like that, we would have been saying he was playing out of his skin. Or would we? Was this a trick of the light? Or the sound? When the roof is closed (as it was in the 5th set), I think the sound of racquet on ball does change a little. And the commentators kept quoting the speed of the ball from Rosol’s forehand, which they don’t normally do, so we had nothing to compare with. Were the speeds actually very high or were we just being given the impression that they were because the commentators recited them in a surprised tone of voice? But what does it mean to say, as you did: Rosol was “wildly under-rated”? By whom? He’s ranked No 100 because he has amassed only 553 ranking points over the past 12 months. Rafa has 10,000 points. Rosol hasn’t been past round 2 in a slam or round 3 in a Masters in the past 12 months. His career high was a ranking of 65. All eyes on court 12 at around lunchtime today – weather-permitting. … Oh, I nearly forgot. Shame about the second and third paras of your blog. The top three players are undoubtedly in a league of their own, with Murray lagging behind at No 4. He has yet to trouble the engravers at any of the slams. But the rest of those two paras doesn’t really stand up to scrutiny. Murray has won many, many tournaments where the other three turned up and beaten them en route to the silver. The gulf between the current No 1 and No 4 is big. It’s winning three out of four grand slams vs going out in the semis. But the 10th ranked player (Isner) tends to go out in the second or third round – a much larger gap. Even the No 5 struggles to make it to the semis (three times in a career – all losing). Murray has played nine (five in a row) and three finals. Hi Simon, thanks for the comments. You raise some great points. And, despite his admittedly previously unimpressive form, I think most people would agree that Ranking 100 would appear not to reflect Rosol's abilities. In that sense he was wildly under-rated. I hope we can agree at least that Rosol's incredible accomplishment beating Nadal, is a good reminder that talent, self belief and sheer will power are highly potent against the 800 pound gorilla incumbents. 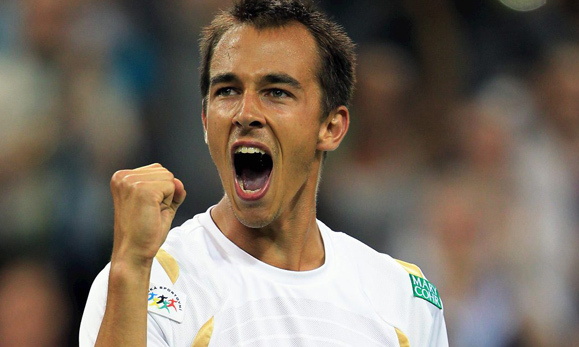 So was Rosol really under-rated or was Thursday an aberration? How should we rate a player who consitently doesn't perform well but once performs brilliantly? What does Martina say? I think she agreed with you on the matters where I too agreed with you. But I don't think she gave you much assistance with the rest of your thesis. Yes, "there is a huge gulf between the fourth best player in the world and the best player in the world". But, today, the gulf favoured the the No 4 player. Andy Murray has just taken Roger Federer apart in straight sets at the Olympics. What has changed? I read yesterday that Murray said he viewed this final as different from the grand slams he lost because neither player in this final has yet won a gold medal, so they were on more equal terms. If that was Murray's mindset going into the match, what an amazing difference it made. And Federer? Coming off court, he told a BBC interview (http://www.youtube.com/watch?v=Ra33wt2Kgy0) that he had been left "emotionally drained" from the earlier rounds. But he also thought "a few points here and there and things could have been very different". If Andy Murray had said that after one of his straight sets defeats, the press would have been all over him for self-delusion. Time will tell whether this is a turning point for Andy Murray. But one thing HAS been established. It can never again be said that Murray can't beat Federer (or Djokovic) in a match his opponent is trying to win. Simon, yes completely agree with everything you say. Awesome effort by Murray. Feels like he has come of age. It will be interesting to see whether he is able to repeat the feat in a Grand Slam.